Weblate organizes translatable content into a tree-like structure. 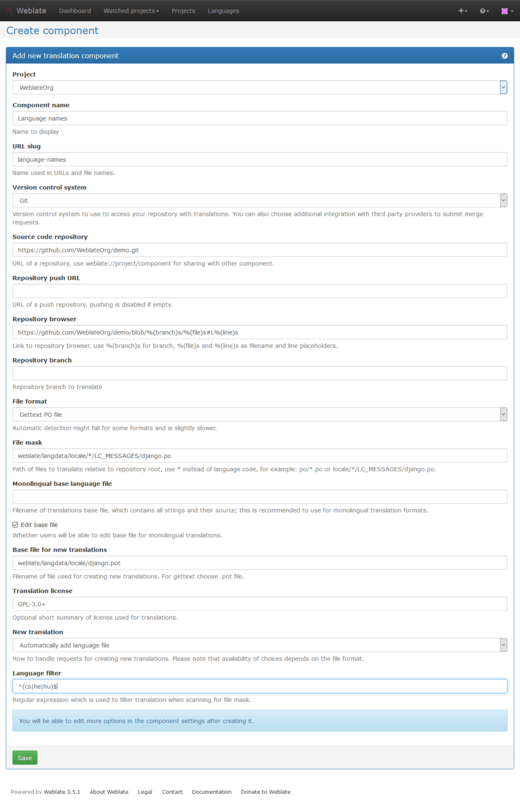 The bottom level object is Project configuration, which should hold all translations belonging together (for example translation of an application in several versions and/or accompanying documentation). On the level above, Component configuration, which is actually the component to translate. Here you define the VCS repository to use, and the mask of files to translate. Above Component configuration there are individual translations, handled automatically by Weblate as translation files (which match the mask defined in Component configuration) appear in the VCS repository. All translation components need to be available as VCS repositories, and are organized in a project/component structure. Weblate supports a wide range of translation formats (both bilingual and monolingual ones) supported by Translate Toolkit, see Supported formats for more info. You can share cloned VCS repositories using Weblate internal URLs. Using this feature is highly recommended when you have many components sharing the same VCS. It improves performance and decreases the required disk space. Changed in version 3.2: Since the 3.2 release the interface for adding projects and components is included in Weblate, and no longer requires you to use Django admin interface. Changed in version 3.4: As of 3.4, the process of adding components is multi staged, with automated discovery of most parameters. Based on your permissions, you can create new translation projects and components in Weblate. It is always permitted for superusers, and if your instance uses billing (e.g. like https://hosted.weblate.org/ see Billing), you can also create those based on your plans allowance. Creating a new translation component can be initiated via a single click there. The process of creating a component is multi-staged and automatically detects most translation parameters. To add a new component for translation, you need to create a translation project first. The project is like a shelf, in which real translations are stacked. All components in the same project share suggestions and their dictionary; the translations are also automatically propagated through all components in a single project (unless turned off in the component configuration). URL where translators can find more info about the project. URL to more site with more detailed instructions for translators. Whether Weblate should manage the Translation-Team header (this is a GNU Gettext only feature right now). Whether to use shared translation memory, see Shared translation memory for more details. Configure per project access control, see Per project access control for more details. Enable review workflow, see Dedicated reviewers. Whether unauthenticated Notification hooks are to be used for this repository. 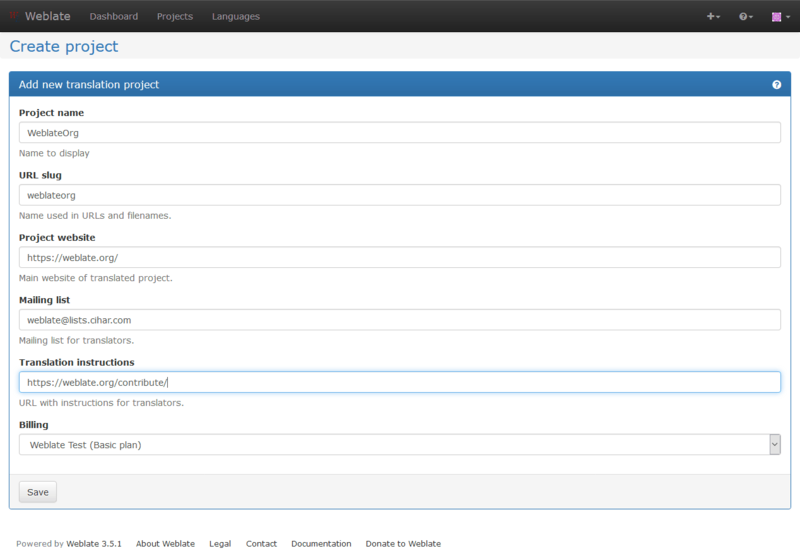 Most of the fields can be edited by project owners or managers, in the Weblate interface. There are also additional features which you can control, like automatic pushing of changes (see also Pushing changes) or maintainership of the Translation-Team header. A component is a grouping of something for translation. You enter a VCS repository location and file mask for which files you want translated, and Weblate automatically fetches from this VCS, and finds all matching translatable files. You can find some examples of typical configurations in the Supported formats. It is recommended to keep translation components to a reasonable size - split the translation by anything that makes sense in your case (individual apps or addons, book chapters or websites). Weblate easily handles translations with 10000s of strings, but it is harder to split work and coordinate among translators with such large translation components. Should the language definition for a translation be missing, an empty definition is created and named as “cs_CZ (generated)”. You should adjust the definition and report this back to the Weblate authors, so that the missing languages can be included in next release. This can either be a real VCS URL or weblate://project/component indicating that the repository should be shared with another component. See Weblate internal URLs for more details. Repository URL used for pushing. This is completely optional and push support is turned off when this is empty. See Accessing repositories for more details on how to specify a repository URL. URL of repository browser used to display source files (location of used messages). When empty, no such links will be generated. For example on GitHub, use something like https://github.com/WeblateOrg/hello/blob/%(branch)s/%(file)s#L%(line)s.
URL where changes made by Weblate are exported. This is important when Continuous localization is not used, or when there is a need to manually merge changes. You can use Git exporter to automate this for Git repositories. Which branch to checkout from the VCS, and where to look for translations. Mask of files to translate, including path. It should include one “*” replacing language code (see Language definitions for info on how this is processed). In case your repository contains more than one translation file (e.g. more Gettext domains), you need to create a component for each of them. In case your filename contains special chars such as [, ], these need to be escaped as [ or ]. Base file containing string definitions for Monolingual components. Whether to allow editing the base file for Monolingual components. Base file used to generate new translations, e.g. .pot file with Gettext, see Adding new translations for more info. 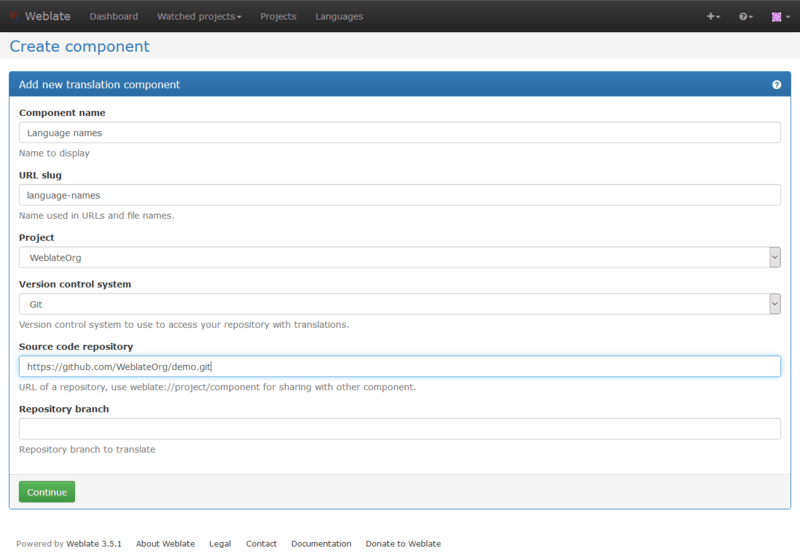 You can turn off propagation of translations to this component from other components within same project. This really depends on what you are translating, sometimes it’s desirable to have make use of a translation more than once. It’s usually a good idea to turn this off for monolingual translations, unless you are using the same IDs across the whole project. Whether to store a history of translation changes in the database. Whether translation suggestions are accepted for this component. Turns on votecasting for suggestions, see Suggestion voting. Customization of quality checks and other Weblate behavior, see Customizing behavior. License of the translation, (does not need to be the same as the source code license). URL where users can find the actual text of a license in full. How to handle requests for creation of new languages. Please note that the availability of choices depends on the file format, see Supported formats. You can configure how updates from the upstream repository are handled. This might not be supported for some VCSs. See Merge or rebase for more details. Message used when committing a translation, see Template markup. Name of the committer used for Weblate commits, the author will always be the real translator. On some VCSs this might be not supported. Default value can be changed by DEFAULT_COMMITER_NAME. Email of committer used for Weblate commits, the author will always be the real translator. On some VCSs this might be not supported. Default value can be changed by DEFAULT_COMMITER_EMAIL. Whether committed changes should be automatically pushed to the upstream repository. Sets how old changes (in hours) are to get before they are committed by commit_pending management command (usually executed by Cron). The Default value can be changed by COMMIT_PENDING_HOURS. Regular expression used to filter the translation when scanning for file mask. This can be used to limit the list of languages managed by Weblate (e.g. ^(cs|de|es)$ will include only these languages. Please note that you need to list language codes as they appear in the filename. Weblate uses simple markup language in several places where text rendering is needed. It is based on The Django template language, so it can be quite powerful. Translation stats, this has further attributes, examples below. Author of current commit, available only in the commit scope. …and other Django template features. If you are importing huge translations or repositories, you might be hit by resource limitations of your server. Check the amount of free memory, having translation files cached by the operating system will greatly improve performance. Disk operations might be bottleneck if there is a lot of strings to process - the disk is pushed by both Weblate and the database. Additional CPU cores might help improve performance of background tasks (see Background tasks using Celery). Some quality checks can be quite expensive, and if not needed, can save you some time during import if omitted. See CHECK_LIST for more info on how to configure this. In case your project has dozen of translation files (e.g. for different Gettext domains, or parts of Android apps), you might want to import them automatically. This can either be achieved from the command line by using import_project or import_json, or by installing the Component discovery addon. To use the addon, you first need to create a component for one translation file (choose the one that is the least likely to be renamed or removed in future), and install the addon on this component. For the management commands, you need to create a project which will contain all components and then run import_project or import_json. Fulltext search is based on Whoosh. It is processed in the background if Celery is set up. This leads to faster site response, and a less fragmented index with the added cost that it might be slightly outdated.